Monk seals live in Hawaii and in some parts of the United States and belong to animals in danger of extinction. This species currently consists of 1,400 individuals and the threats that surround them are hunting, disease or entanglement in fishing nets, but a new enemy has emerged that gets stuck in his nose. Circulate a photograph in which a Hawaiian monk seal has a long eel obstructing its nose. This phenomenon would complicate the conservation of this species, as it can cause infections or decreased appetite or even in their ability to dive. 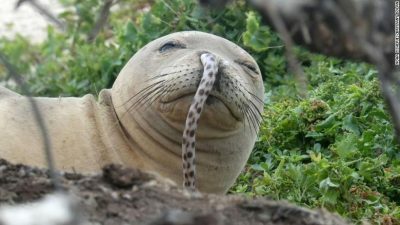 The possible reasons that the specialists have obtained would be that the seals regurgitate their food commonly and when vomiting the eels remain stuck in their noses. Another theory would be that the eels hide in the nostrils of the seals to avoid being their food. If constipation of mucus is already an uncomfortable symptom, now imagine these poor little foxes with their noses completely obstructed by an animal that is struggling to survive. Newer PostThe Unicorn of the Sea that Measures 9 Meters, What is it Really?